Spaces Podcast is available on various platforms. Connect through the links below to subscribe. If your preferred platform is not available, please let us know what platform to add to our network. if you have a soundcloud account, sign in and You can catch up on the show here, as well as see episode images, videos & notes below! S01_ep26: breweries | spaces podcast live! An explosive growth of the craft brewing industry has resulted in comparable growth in commercial space being used for brewing. 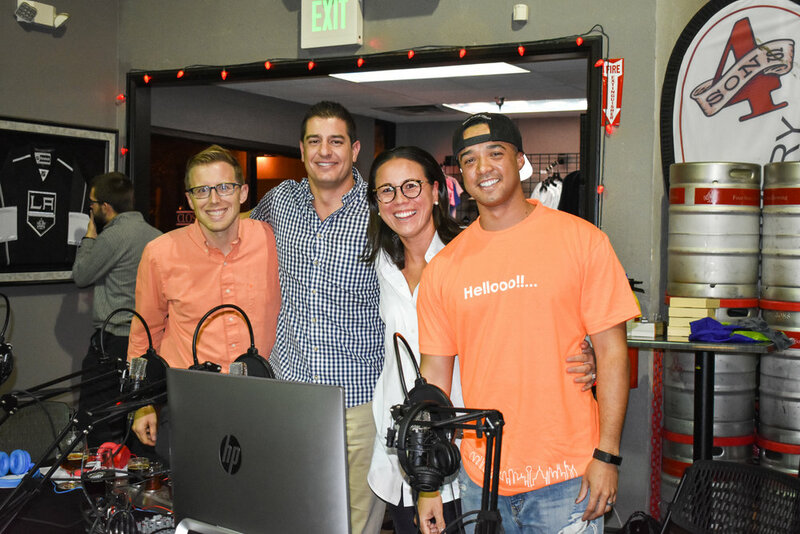 In this LIVE recorded episode, we are on location at Four Sons Brewing in Huntington Beach, CA to celebrate our first year anniversary, help raise funds for HomeAid OC, and discuss breweries! Evan Miles, a Project Manager at Home Aid OC, sits down with us to briefly highlight HomeAid, and Duke and Deven, of Four Sons Brewing, join the show to discuss more about the business, design & construction considerations, and societal influences on the industry. Project Manager for HomeAid OC, a national non-profit organization that builds new lives for homeless families and individuals through housing and community outreach. With the purpose to end homelessness, HomeAid focuses on three areas - advocacy, development and service. To find out more visit HomeAid.org and to help monetarily, please consider donating. Any amount is appropriate and appreciated. Duke (Dad: Pictured Left), President of Four Sons Brewing, grew up in New Hampshire and attended the US Air Force Academy in Colorado. He spent 5 years as an officer in the Air Force and then spent 27 years at Northrop Grumman where he played a key role in many military aircraft programs, most notably the B-2 Bomber. Duke holds a B.S. Degree in Aeronautical Engineering as well as an MBA. He retired in 2014 to pursue the awesome opportunity of spending every day with his family. Deven (Oldest Son: Pictured Bottom Center), Director of Operations of Four Sons Brewing, uses his B.A. Degree in Communications and MBA, to build relationships with world recognized brands, bands and events to support the growth of the business. He also helps oversee the day-to-day operations. Prior to Four Sons Brewing, he worked at Northrop Grumman on an advanced unmanned aircraft program. Airports are one of the most complex building types in the industry due to the extensive facilities and systems it must accommodate. Ben Regnier, Senior Associate at Gensler, joins the show to share his expertise. In this episode we discuss the evolution of airports and aviation, design and construction considerations, and a future of airport design focused on elevating the passenger experience. Senior Associate at Gensler, with experience and knowledge in implementing advanced technology in architectural design, from building information modeling (BIM) and integrated project delivery to computational design, data visualization, and digital fabrication. In addition to his roles as a BIM leader, he is a practicing architect with experience in aviation, education, and sports practice areas. The controversial art form of Graffiti has grown from its outlaw past to be an accepted element in beautifying some urban communities. Danni Simpson, commercial and street artist, of Danni Simpson Art joins the show to discuss her style and inspiration, participation in the movement and experience of a renewed relationship between graffiti/street art, municipalities and the building industry. Despite being fresh to the art scene, this Australian artist has quickly become well known for her commercial and urban street art across the globe. Her unique approach to mandala flora and fauna illustrations, mixed with elements of typography create iconic pieces for the world to enjoy. Urban population growth and the dependence on transportation has reached a point where 30 to 60% of urban areas are taken by roads and parking lots. Subsequently, mobility issues have exponentially increased. Brandon Reyes P.E., Project Manager at Michael Baker International joins the show to discuss changes in transportation on the horizon and how they may affect the future of spaces we occupy every day. A registered PE in the state of California and a Project Manager for Michael Baker International - a national Civil Engineering Consulting firm. Brandon manages large transportation infrastructure projects, specializing in freeway and interchange work throughout the Southern California area. Working with state and local agencies as well as developers, Brandon has quickly become a leader in the industry that focuses on improving traffic, safety and the movement of goods. Aside from delivering large scale projects, Brandon teaches a well-known annual PE exam crash course on transportation as well as takes part in the education of the undergraduate Civil Engineering program at his Alma mater, Cal Poly Pomona. Brandon is enthusiastic about the future of transportation and how it continues to shape our everyday lives. In the spirit of Halloween, Spaces Podcast presents the first edition of "Haunted Spaces." In this episode we highlight the Hotel Monte Vista in Flagstaff, Arizona and its collection of horrifying guests. Multifamily housing has historically been an affordable housing solution, however, rising land values, housing policy and slow growth has even impacted its affordability. In this episode, David Senden, Principal and Board of Governors member of KTGY Architecture + Planning joins us to discuss project complexities and issues, political and societal changes, trends, and potential solutions to alleviate the housing crisis. Principal and Board of Directors member of KTGY Architecture and Planning. As part of the new generation of leadership at KTGY, David is instrumental to the expansion and increased design profile of the firm. He specializes in urban infill residential and mixed-use developments, with work across the United States and internationally. In addition, he has a substantial portfolio of campus housing and specialty projects including affordable developments and recreation facilities. As member of the Board of Directors, David is responsible for setting the big picture, strategic vision for the firm, increasing the firm’s profile and ensuring work at the highest levels. He was named to Building Design + Construction magazine’s list of the industry’s top 40 under 40 and has designed numerous award-winning projects from coast to coast. David is a frequent speaker at various national and regional industry events and has written and contributed to countless articles touching on all aspects of design and the building industry. As a lecturer and critic at several universities, he emphasizes the connection between the profession and academia and values mentorship as key to developing talent and integrating the most current design thinking. Almost 75% of Millennials and Generation Z are willing to pay extra for sustainable offerings! This willingness will play a major role in the future of gym design and operations, especially if your workout can generate electricity. Yes, you read that right...generate your own electricity! Matt Thorsen, Product Manager at Sportsart joins the show to highlight the ECO POWR fitness line and discuss current and future trends in gym design and construction. Product Manager at SportsArt. Matt uses his experience as a collegiate athlete, personal trainer and his Master’s Degree in Exercise Science to bring new insights and approaches to the fitness industry. He currently leads the development of new products worldwide that follow the highest standards for biomechanics excellence while maximizing the usage for members and club owners alike. In 10 short years, tech investments in the building industry have increased from $4.5 million to $1.38 billion annually! In this episode we discuss products and technologies that are changing the industry today and in the near future. We highlight wearable technology, management software, robots & drones, blockchain, social media marketing, VR & AR, and the implications of design software advancements. Google and Tesla and Amazon, oh my! Buildings today cause 39% of CO2 emissions in the US. If you have not heard of LEED and or WELL, today's episode is a great intro into these industry design standards that are shifting buildings to healthier and more human-centric spaces. We discuss environmental and green building history, LEED and WELL basics, industry perception, issues and potential value. Ever wonder what it's like to be an architect, engineer, developer or contractor? In today's episode we welcome our guest Puneet Comar, Director of Land Development, US West of IBI Group to join our discussion on career planning in the building industry. Through this discussion we'll discuss what attracted us to the industry, salary expectations, educational requirements, critical business issues to be addressed in the near future, licensing tips and what to consider when evaluating career growth progress. Director of Land Development, US West for IBI Group, Puneet is described as "an exacting, energetic and seasoned professional, Puneet is renowned for his exceptional engineering design skills as well as strong organizational acumen......Puneet’s exceptional expertise, responsiveness and sensitivity to client needs reinforce and enhance his leadership role in providing master planning solutions." Puneet started working in the Civil Engineering field after freshman year of college. Since, he’s worked on and manage a variety of Land Development and Capital Improvement projects in several cities and counties throughout Southern California, from single lot custom home sites to a 2000 home master plan development with major infrastructure design. He’s participated in design efforts for development projects oversees in Saudi Arabia and Egypt. Dimitrius’ wife’s mosquito bites as heard on the show - skeeter syndrome is no joke! A national conversation about housing is coming to the forefront. In this episode we explore how we may have gotten here. We discuss current issues of affordability, potential causes - labor shortage, raising land and material costs, immigration - and potential solutions now and in the future. Humans, throughout history, have had an innate desire to reach for the sky. Today we explored the avenue to do so via skyscrapers. We highlight the history, explore the economics of their development, and discuss trends of safety and innovation that have allowed these buildings to reach new heights! We pose the question, "How relevant are skyscrapers to Millennials?"... and find out Dimitrius' Top 5 movies with skyscrapers. It's summertime! Today's episode dives into the history, development and currents trends of amusement parks. We chat a bit about popular parks such as Disneyland and Six Flags, features like the Wizarding World of Harry Potter and test Jason and Michelle's knowledge about Amusement Parks. What Does the Future Hold for Theme Parks? Spaces Podcast welcomes in a new team member! Michelle Thrakulchavee, Vice President of Land Acquisition at City Ventures, joins the show and highlights her background. The incarcerated population has ballooned over the last 50 years and public attitudes have slowly shifted towards active pursuit of criminal justice reform. However, we can't forget about prison design itself. In today's episode the guys highlight key points of criminal justice reform and discuss the evolution of prison design and potential improvements for the future. Education and school safety are some of the most polarizing topics in our society today. In this episode, Todd Ferking, an architect and principal of DLR Group, joins the show to discuss school design, how to promote a good educational environment, and achieving a balance in design that will encourage a safe space for students. In today's episode we welcome our guest, Sara Bendrick, landscape designer and host of DIY Network's "I Hate My Yard" and "Lawn & Order", to explore the home renovation industry, DIY vs. hiring a professional, tips and highlighting the process of renovation. A landscape designer by trade. Sara was born & raised in San Diego, California, and started at a young age with a passion for art, nature and an appreciation for anything living. She studied at Cal Poly San Luis Obispo and received her Bachelors of Science in Landscape Architecture. Sara is the principal designer for Sarita Lanscape Design, a contractor, she's published a book, "Big Impact Landscaping," and is a host on DIY Network's "I Hate My Yard" and "Lawn & Order"
(Ali's blog post) | Supply Sruggles? Blame Existing Homeowners! M.Arch I candidate at the University of Texas at Austin School of Architecture, pursuing a career as an architect. He also holds a Bachelor of Arts in Interior Design from Harding University. Richardson is most notable in the design community for building his innovative Tiny House on Wheels, known as "Kinetohaus," right out of college before moving to Austin for graduate studies. A hands-on experiment with design-build and affordable, alternative housing, the tiny house would be featured on HGTV's show, "Tiny House, Big Living," and as part of UT Live at SXSW Interactive 2017. Moving forward, he intends to explore the overlap of high design and affordable housing by offering alternatives to the status quo. Warning...this episode may make you hungry. In today's mouth watering episode you'll hear about apple fritters, western bacon cheeseburgers, and seasoned fries from the "roach coach". We explore the evolution of restaurants and the types of restaurants that exist today. Who Invented the First Modern Restaurant? Reunited and it feels so good...The group is back together to take a closer look at hotels. We explore the evolution of hotels, discuss some of our hotel experiences, and take a look at trends going forward. In other news, Jason has a heavy foot, Ali has a addition to the family, and Dimitrius gives an update on Bloo. Hotels, and the hospitality industry in general, are evolving into more experience based businesses, even becoming an extension of the entertainment industry, as shown in MGM resorts new ad campaign "Welcome to the Show"
In today's episode we welcome our guest, David Gillanders Jr., Executive Director of Pathways of Hope, to discuss homelessness and explore potential housing solutions to combat the issue. This fascinating and insightful episode may change or add clarity to your understanding of homelessness and motivate you to get involved in the effort of ending homelessness. Executive Director of Pathways of Hope. As a lifelong Northern Orange County resident, David has committed his career to ending homelessness and hunger in his community. A Brea-Olinda High School, CSUF (and DePaul) graduate, he now resides in Old Towne Orange with his wife and partner Sarah and their young children, Maxwell and Sophie. David enjoys cycling, collecting records, books and tattoos, running around after the kids, and being on the search for the perfect espresso, beer, and vegan food. Have you been to a hospital lately? The design & construction of that space may be more complex than you know. In this episode we explore the history, construction delivery methods, issues, advancements, and trends in hospital design & construction. In other news, Dimitrius shares his medical background, Jason goes to the Barre, and we received our first hate post! Additional details on the story of Alexander Anderson, the first physician at Bellevue, and other crazy Bellevue stories can be found here. Additional information on BIDMC renovation as discussed on the show can be found here. Architect: PAYETTE - additional project details and images can be viewed here. In this highly anticipated episode, things get a little heated in the studio as we debate the Millennial experience and discuss the Millennial effect on design of various spaces such as housing, offices and retail. In other news, Ali's under surveillance, Jason nearly starts a riot, and Dimitrius announces a major career move! They have the highest average number of Facebook friends, with an average of 250 friends vs. Generations X's 200. In today's episode we welcome our guest, Lawrence Armstrong, Ware Malcomb CEO, to explore what goes into developing company culture and how space can foster that culture. Is the fun and open space office still relevant and applicable today? Catch up on what we've been up to during the holiday break. We even chat about art as we discuss Larry's "weekend job" as an artist...and who did it better? Top 5: Find out our top 5 projections for 2018. CEO of Ware Malcomb, a leading international design firm, accomplished architect and business leader. Strategic, visionary approach to company’s management and growth. Strong design ability and focus on creativity and innovation. 2008 Winner of Ernst & Young’s Entrepreneur of the Year Award, Orange County/Desert Cities Region and a national finalist. Licensed Architect in over 45 states and general Canadian provinces. Received Bachelor of Science in Architecture (1979) and Bachelor of Architecture Degree (1980) from Kent State University. Member of the National Council of Architectural Registration Boards (NCARB). LEED Accredited Professional. Guest lecturer for USC Lusk Center for Real Estate, Chapman University and UCI. On the heels of Bill Gates' Arizona land purchase and goals to build a smart city, we tackle the subject to clarify what a "smart city" is. We discuss the benefits, the disadvantages and who from the group would want to live in one...We also explore other planning concepts as a comparison to a smart city. We introduce a new segment - Dimitrius' Top 5: Find out his top 5 movies with a smart city setting. What are yours? Singapore commitment to become a "smart nation"
Today's episode is all about off-site construction. We discuss prefabricated, modular and panelized construction - the differences, benefits, and disadvantages of the methods. In addition to current trends, the team highlights a couple of historical references that displayed these concepts early on. Meet the crew! In this, the first episode of Spaces, we describe the concept of the show and highlight the hosts Jason, Ali and Dimitrius' individual professional and personal backgrounds.